Salam and happy Saturday peeps! Anyway, we too celebrated the Hari Raya albeit in a very modest and low-key way. By low-key, I mean that we don't have meat on the menu. Plus, we stayed home the whole day and did not have anyone over to celebrate it. So if we don't have meat, what did we have ya? Sorry for the poor quality of the picture because I was hungry when I took it! So I just quick-quick snapped the photo and then tucked into our very delicious lunch. Hehe. As usual we love home-cooked feast. So all of the above are home-cooked :) Thank goodness for Google, I can google the recipe and prepared the feast even if it was my first time to get the nasi minyak right! Hehe. The first time I cooked nasi minyak was when we first got married and we had friends coming over. 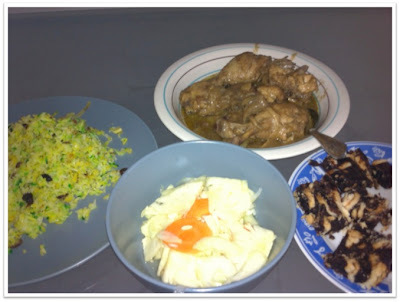 I went through the laborious process of preparing nasi minyak, dalca and ayam masak merah. The ayam masak merah was perfect, the dalca was delicious (thanks to my friend Bib who texted the recipe back when we don't have Internet access at home!). The nasi minyak was all right - except that it was bright red! You see, I didn't know that I was supposed to just dot the rice with the food colouring. What I did was made a hole in the middle of the rice after it was cooked, and then immediately stirred the rice! Of course the whole pot of rice turned red. Hehe. When our friends asked why was our nasi minyak red in colour, we lied and said that was how we do it in Sarawak. LOL! I got the recipe from someone's blog but I modified it a bit - like using only Ghee to stir-fry the onion, garlic and all the spices when the blog mentioned that I should use vegetable cooking oil and Ghee. Reason being, I wanted to have a healthier version of nasi minyak. 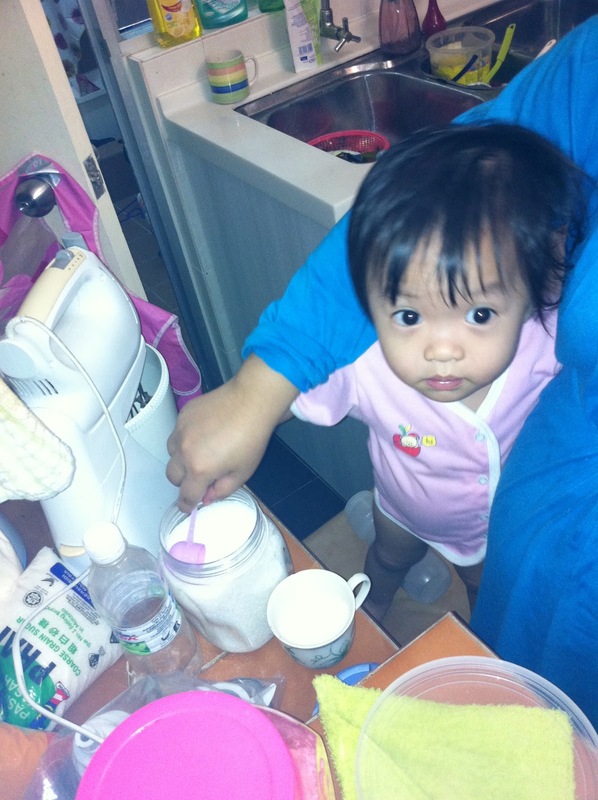 I had to help her scoop the sugar though, because she is still developing her hands-eye coordination skills :D But she was thrilled to help anyway. She even helped with breaking up the Marie biscuits for the cake. It was so cute and hilarious to see her went 'ooh' when I broke the eggs into the rotating mixer bowl. Hehe. When it came to stir the cake batter in the wok, I had hubby to do it because it was hard work. So the whole family chipped in with making the cake. He also helped to compress the hot cake in the cake tin. So that's the story of our Hari Raya celebration and the feast that we prepared. It may be simple, but what matters is with whom we celebrate and the heavenly taste of our own air tangan, right? Now will you excuse me because talking about food is making me hungry and the baby has been kicking me non-stop :p Time for lunch. Happy weekend guys!